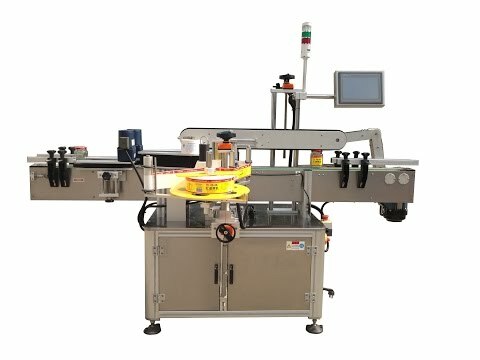 This labeling machine suit for labeling single side, double sides, three sizes, and even four and five sides of food products, health care products, and other packaging industries. The labeler also available for labeling different products shapes, like round shape, square shape, bottles, jars or drums. Coding: optional for heat transfer printing pneumatic coding, marking, laser and labeling. Automatic product detection: available to add optical detecting system, to prevent missing labeling, wrong labeling, repeat labeling, mis-position labeling, coding fuzzy, or missing coding etc. Material collecting structure: available for single machine operation and working with labeling process, greatly cut labor’s cost, increase production efficiency. Multi-function labeling machine, good for labeling square bottles, flat bottles, multi-sides bottles for single size labeling, multi-sides labeling and even around labeling. Increase wheel plate type labeling structure, effectively assure accurate labeling square bottles, flat bottles for 5 sides bottle labeling process. Adopts imported controlling system, servo motor or step motor for label feeding and outputting, Germany Leuze automatic label detecting system for accurate label position. Touch screen controlling system, operation easy and directly, function complete, mult-groups pre-setting memory, including production accumulation, setting adjustment, error indicating functions. This labeling machine has auto position fixing function, no product no labeling, automatic regulating for no label, and automatic label detecting function, to prevent missing label or label waste. The labeler realize one machine for multi labeling purpose, good for single machine production, also available to connect with production line. The labeling machine’s bottle and parts are made of S304 stainless steel, and high grade aluminum alloy which have twice surface processing. Not get rust and have high resistance to corrosion.